Place all ingredients in a small sauce pan. Simmer over medium heat for 5 minutes, just to soften the dates and marry the flavors. Pour the warmed ingredients into your high speed blender, and blend on high speed for 1 minute. (Careful blending warm liquids!). Place your mesh strainer over a small bowl and strain the paleo +whole30 worcestershire sauce. Discard any remaining solids. 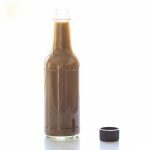 Store your paleo + whole30 worcestershire sauce in tupperware, mason jar or glass storage jar in the refrigerator. Will keep for 6 months.